Chocolate is something that no one can resist. Almost everyone is fond of chocolates. It is made from cocoa pods that grow on the Theobroma cacao tree. There is a whole lot of variety when it comes to chocolate. Each type is made of different composition and tastes differently. You can get the very delicious and tempting medium and large African mud chocolate from Giftwrap. Get it to gift it to someone or keep it please your taste buds. This chocolate will give you a heavenly taste. 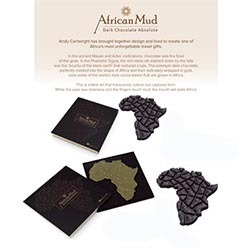 African mud chocolate comes in a beautiful presentation box that gives you a very distinct look; it can be a perfect gift for your loved one on any occasion. Chocolates are known to be the language of love and rightly so. Delight your partner with this premium African mud chocolate from Giftwrap and show your love. It comes in two different sizes on Giftwrap, medium and large. Choose the one that you desire to and get the taste of this mouth watering mud chocolate.